The deal will see Lockheed Martin start manufacturing Crowsnest, a helicopter-borne airborne early warning and control system for the Queen Elizabeth class carriers. Under Secretary of State for Defence Procurement Minister Harriett Baldwin announced the deal today onboard Type 45 Destroyer HMS Dragon. “The Crowsnest project will act as the Royal Navy’s eyes and ears for its next generation carriers, giving long range detection as well as the capability to track potential threats. Crowsnest will be able to support wider fleet and land operations, replacing the Sea King helicopter’s Airborne Surveillance and Control capability that has been deployed on regular operations since 1982. According to material accompanying the announcement, the Thales solution is an updated and improved version of the Cerberus tactical sensor suite, currently in service on the Sea King Mk7 helicopter. 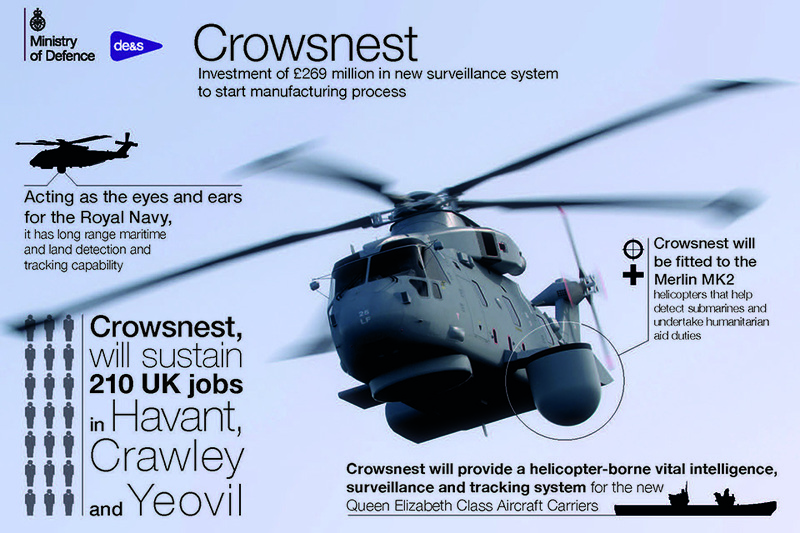 Crowsnest will be fitted to Merlin Mk2 helicopters, the image below is an infographic provided by the Ministry of Defence. “Crowsnest will play a key role in protecting the Royal Navy’s future fleet acting as the eyes and ears for the new Queen Elizabeth Class aircraft carriers. This state-of-the-art project will demonstrate how we are providing world-leading, innovative equipment to our Armed Forces. “Crowsnest will form an integral part of future carrier operations and act as the Royal Navy’s eyes and ears, providing protection through early warning and surveillance. This is obviously an essential contract when people stop and actually think about the extensive use the UK made of the baggers. One more important step forward in bringing the QEC into front line service. This is a sensible step interim step but, obviously, helicopter-borne awacs is fundamentally flawed. Drones are the future of awacs. I envisage four to six high-endurance drones working together. They would be networked together so that they could carry smaller radars than conventional awacs aircraft and still achieve 360 degree, persistent, coverage. Think how powerful the internet is – lots of linked small computers. Apply that concept to drones/awacs. Cab numbers though – so very low. What about bringing back those 12 mothballed Merlins as a start? So if this is just the contract to enable Crowsnest to be fitted to any of the Merlin Mk2’s, how many Crowsnest will actually be purchased? Based on the seeming omission of this data, may we guess less than needed? By the way, where’s the obligatory mention of the mythical 178 billion new equipment plan? At some point these shysters really need to be challenged on what exactly is being acquired and over how many decades. At 269 million GBP this is slightly more than we give to India in aid in a year. India. That India. The one with a nuclear arsenal and space programme. You forgot to mention Barry that India with a bigger Army, Navy and Air Force than we do and never seems to stop ordering new Gucci kit! It’s enough to make you weep especially when the Foreign Aid lot are sitting on 5Bn pounds that they literally can’t give away fast enough! Scandalous!! Will this country ever learn…. And they keep buying Russian and French military equipment. To be fair to India, they were a bit bemused that we kept thrusting the dosh at them even when they said they were more than able to cope without it (hence the nukes and space programme). Also, didn’t this aid package actually stop into 2015? I thought Uk Government was going to stop giving international aid to India, i could be mistaken on that info: though..
Perhaps somebody on here could clarify that ? So, how many units will this £270m deal purchase? According to Lockheed Martin UK press release today, it will be for all ten units as originally contracted for to be fitted to any of the thirty Merlin Hm2’s that have been upgraded. Should been based on osprey. We will need to buy some anyway at somepoint to enable replenishing the ship ie fly in new f35 engine. Ospreys would be fantastic and agreed they are better than a helo option but are too expensive; that means none for the RN unfortunately…. No it is not. No work is being done on an AEW Osprey. Rumour special forces are getting them. Secondly we will need an aircraft to act as standby tanker for returning aircraft- the osprey is already being developed for this. Just to clarify Andy; the SAS is getting only ONE Osprey to move Sabre Squadron more quickly around the U.K. to support operations. One won’t work – needs a minimum 2 sndcgjven the supposed budget for this it would be more than one. I bet the RN is planning on asking marine Coro to put their ospreys on the carriers. I agree Andy but one was what the article stated – for what that’s worth – due to cost. Again, pure speculation and when it comes to Special Forces no one will ever really know anyway. The problem with this is they are using some of the 30 Merlin which should be for ASW instead of properly replacing the Sea King ASCS, rather than the spare cabs already mentioned by others. Just look what is happening to the army at the moment under their supposed rising budget. That rising budget just winds me up ! Only reason we hit 2% is cos they included the security services budget and pension contributions which most of not all other NATO countries don’t include!! We know the old Sea King system was heavily used by the Royal Navy, but what we do not know is if it is any good. From what i understand the radar dates back to the Falkland war, a period where the royal navy radars had a number of serious issues with tracking targets over land. Was this a issue that the old Sea King system suffered or was this solved through upgrades? How does the radar compare to the ones fitted to the f35’s?